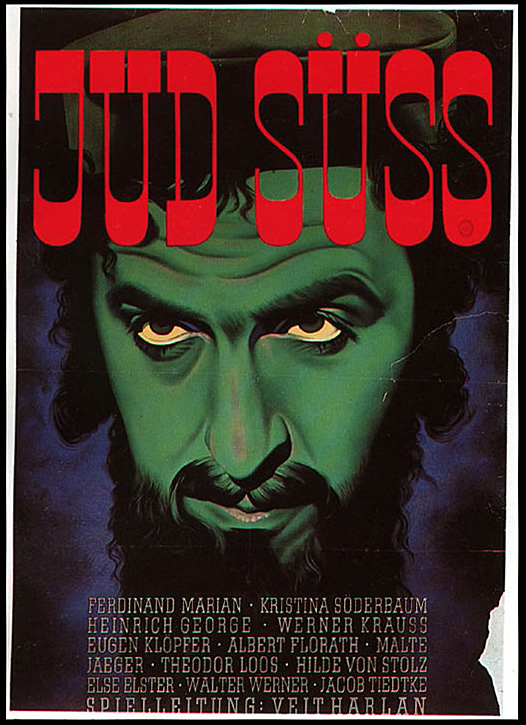 Jud Süß (Jew Süss) is a German film produced in 1940 by Terra Filmkunst at the behest of Joseph Goebbels, and considered one of the most anti-Semitic films of all time. The movie was directed by Veit Harlan, who wrote the screenplay with Eberhard Wolfgang Möller and Ludwig Metzger. The leading roles were played by Ferdinand Marian and Harlan's wife Kristina Söderbaum; Werner Krauss and Heinrich George played key supporting roles. The film has been characterized as "one of the most notorious and successful pieces of anti-semitic film propaganda produced in Nazi Germany." It was a great success in Germany, with some 20 million viewers. Although the film's budget of 2 million Reichsmarks was considered high for films of that era, the box-office receipts of 6.5 million Reichsmarks made it a financial success. Heinrich Himmler urged members of the SS and police to watch the movie. Wikipedia essay on the film "Jud Süss"
Wikipedia essay on "Harlan: In the Shadow of Jew Süss"